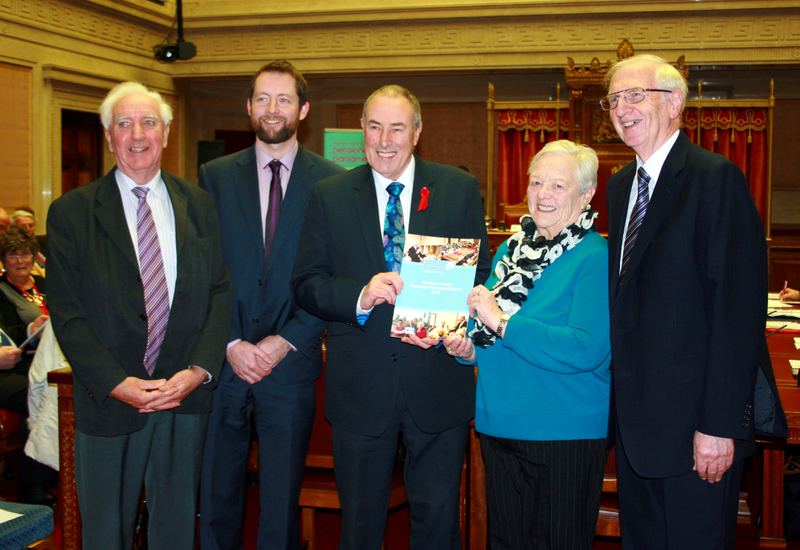 On Tuesday 2nd December 2014 the Northern Ireland Assembly, in partnership with Age Sector Platform (NIASP), hosted the Pensioners’ Parliament in the Senate Chamber of Parliament Buildings. Age Sector Platform is a charity which represents the interests of older people in Northern Ireland. Assembly Community Connect, who work to enhance connections between the Northern Ireland Assembly and the Community and Voluntary sector, welcomed over 80 pensioners from across the province to the Senate Chamber for a 'Question Time' style event. The attendees had the opportunity to ask questions to Jennifer McCann MLA, Junior Minister from OFMdFM, Mervyn Storey MLA, Minister for Social Development, and Jim Wells MLA, Minister for Health, Social Services and Public Safety and have their voices heard by these key decision makers. Anne Watson, Vice-Chair of Age Sector Platform presenting Mitchel McLaughlin, Principal Deputy Speaker, with a copy of the 2014 NI Pensioners Parliament report. They are joined by (left to right) Francis Hughes, Chair, Age Sector Platform; Eddie Lynch, Chief Executive Age Sector Platform; and Michael Monaghan, Chair of the NI Pensioners Parliament. The event was presided over by the Principal Deputy Speaker, Mitchel McLaughlin MLA. The transcript for the December 2014 Pensioners Parliament is available here.